Enterprise scalability and more coming in Veeam Availability Suite 9.5! Last month, when we hosted the Next Big Thing virtual event, we unveiled the latest parts of Veeam Availability Suite 9.5: Enhanced enterprise scalability and advanced ReFS integration, and we have received many questions on both topics. In this post, we will dive deeper into the enterprise scalability enhancements — and I will explain the advanced ReFS integration in another post as it is a significant technology of its own. Each of these features aligns to the data flow from primary and secondary storage, as well as provides enhancements in vSphere and the core product architecture. Let’s go through each of these with some technical detail that will show you why Veeam Availability Suite 9.5 is delivering Availability for the Always-On Enterprise. 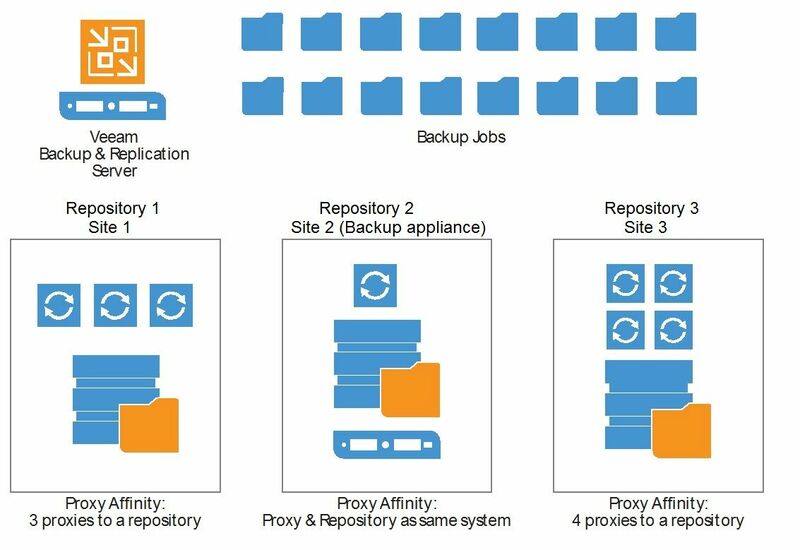 Scalability can be addressed in many ways, but there is a consequence: Higher performance and smaller backup windows may put too much stress on production storage, and therefore, on its performance and Availability to production workloads. To reduce stress on production storage, version 9.5 introduces a new way of reading VM disks that is optimized for enterprise storage. This advanced data fetcher will significantly shorten backup windows due to significant I/O speed increases, while also reducing stress on primary storage due to less storage I/O operations required to complete the job. In addition, when used in conjunction with Backup I/O Control, this new functionality enables the creation of multiple backups per day — thus dramatically improving recovery point objective (RPO) — in environments where it was not possible to do so before without impacting production workloads. Another backup acceleration technology is the new broker service. In prior versions, each job and the UI itself communicated to vCenter Server directly to retrieve virtual infrastructure hierarchy. However, in 9.5, the hierarchy will be retrieved by the broker service and cached in RAM for access at memory speed, while updating in real time via a subscription to vCenter events. While this will significantly accelerate job operations such as “Building VMs list” and UI responsiveness, more importantly, it will reduce the load on vCenter Server — dramatically improving the Availability of this very critical virtual infrastructure component. As a result, customers with large and busy vCenter Server systems will see immediate improvement of backup success rates and a reduced amount of job retries caused by vCenter Server overload. Last but not least, we have significantly optimized vSphere API queries to further reduce the load on the virtual infrastructure when full infrastructure hierarchy retrieval is required (for example, after the backup server restarts, or when the in-RAM hierarchy mirror needs to be populated from scratch). Veeam Availability Suite 9.5 brings a number of new improvements to the restore process with custom tailored logic for a number of restore options: Raw disk, deduplication storage systems and tape. Each of these scenarios will see significant improvements in full VM restore speed. When restoring from backup repositories backed by raw disk, we will now restore multiple virtual disks in parallel (just like we back them up). For EMC Data Domain, we will use a data retrieval logic that is custom-tailored for best performance with this deduplicating storage system. Finally, with 9.5, full VM restores can be done directly from tape, eliminating the need to stage all required backup files on a repository before the VM can be restored. This will save not only time but also storage space on backup repositories for tape restores. We’re also putting a lot of work into our Instant VM Recovery engine, so expect significant I/O performance improvements (up to a few times) with instantly recovered VM boot times and overall I/O performance, especially when running multiple VMs in parallel. Many things have happened under the hood to improve the entire configuration database interaction in 9.5. Veeam Backup & Replication has a SQL Server database for a number of things (configuration, history, jobs and more), and 9.5 introduces a number of major improvements to make the UI more responsive while operating with a large number of objects. To achieve that, we changed the database structure, optimized SQL queries and even created custom UI controls — all to significantly reduce the load on the database. As a result, customers with thousands of protected VMs will immediately notice the difference after upgrading to 9.5! It’s also important to note that 9.5 will only support the Veeam configuration database on SQL Server 2008 or higher to enable us to use advanced SQL Server 2008 functionality (for example around TEMPDB usage) and further improve overall scalability. That said, SQL Server 2005 is still supported as a database that can be backed up with application-aware image processing — however, please note that Microsoft dropped support for SQL Server 2005 earlier this year, so you may want to upgrade to the supported version regardless (and we highly recommend at least SQL Server 2014). Collectively, all of these changes will significantly boost scalability for protecting even the largest environments, and we’re not just talking VM backup processing here! For example, where previously our file to tape jobs struggled beyond a few hundred thousand files, in 9.5, they easily fly through over 10 million files — and do it faster than the leading legacy tape backup software, leaving our beta testers amazed.